Finally! Game Of Thrones uber-scribe George R. R. Martin has joined Twitter, which is fantastic news for all fans of A Song Of Ice And Fire. Bad news: don’t expect to hear from him. While not yet officially verified by Twitter, Martin’s profile legitimacy has been confirmed by his publisher, Random House. 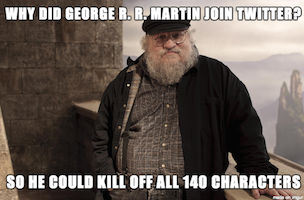 Given time, I wonder if George might take a liking to Twitter – most writers do when they put in the effort – so fans would do well to follow him for tidbits and news on the future of Thrones. 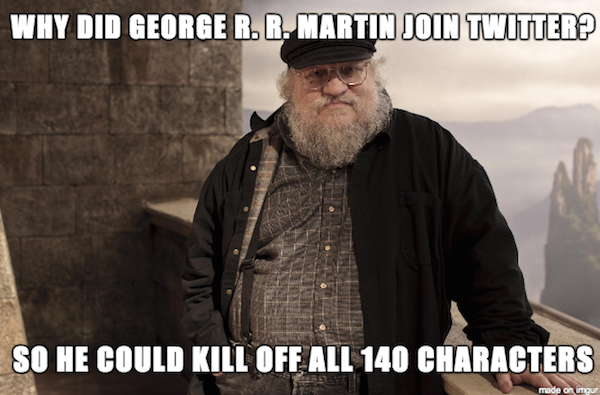 Still, by definition, the more he tweets, the less time he’s going to be spending writing The Winds of Winter, book six of seven in the A Song Of Ice And Fire series, so perhaps it might be best if he stays silent after all.